So what's excercuse? Is it even a word? According to the Urban Dictionary, the definition is: lame reasons not to exercise, often complete BS; usually the result of extreme self-consciousness when it comes to public exercise. 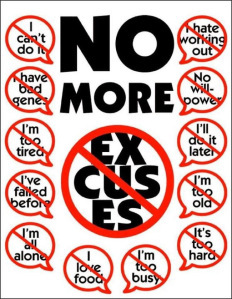 Now, I could easily list all the reasons, stories, excuses or whatever you want to call them of why people don't exercise. The truth is...it just doesn't matter. Besides that, it just turns into a pity party. I could tell you all the incredible workouts, equipment, dvds and gyms that are out there for you but won't do any good if you don't use them. Instead, let's break it down into easy habits that will get your exercise in for the day. Do your workout first thing in the morning. Lay your workout clothes out the night before. As soon as the alarm goes off, change and get started. Get your workout in and you'll have the rest of the day to yourself. This will take care of the "no time" excuse. By doing a little time management, this will help you focus on the habit and the results will follow. Pack a bag with your workout clothing the day before. Keep clothes off of your exercise equipment. Block out your exercise times into your cell phone and stick to it. Keep light weight equipment with you such as resistance bands or a jump rope. Use it as you're watching TV. 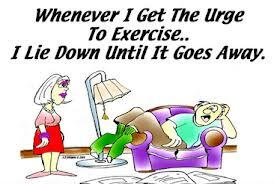 Most people overdo it the first time they exercise. Take it easy! If you're too sore to even walk the next day, there's a good chance you won't continue to develop your exercise lifestyle. The average person doesn't like the way they look in the mirror so they definitely don't feel comfortable working out in front of other people. That's okay! Do jumping jacks in your basement, walk in place while watching TV or dance to your favorite music when you're placed on hold during a phone call. Walk with your friends and catch up on what's been happening with each other. Take up an activity that interests you. Get the kids involved with you. Go biking, hiking or play sports with them. If mornings don't work for you, then exercise at the time that works best for you. Use your breaks and lunches to get a quick walk in. Your dog is a great walking partner!